Canada is often described as somewhere between the US and Europe when it comes to its religious landscape. Religiosity and spirituality indicators (such as service attendance and beliefs in the transcendent) are not as high among the Canadian population as in the rest of North America, but have also not shown the same intensity of decline as in many European nations. This being said, over the last few decades the country has been characterized by many of the same religious trends as seen in most other Western societies. First and foremost, there has been a diversification of the Canadian religious landscape, both within Christianity itself and with many growing non-Christian faiths. Although still characterized by an estimated 67% Christian majority, affiliates of non Judeo-Christian religions now represent 8% of the total population (National Household Survey 2011) — compared with 3% in 1971. Actively practicing a religion is also becoming more of an immigrant phenomenon : in 2013, an estimated 35% of monthly or more frequent religious service attenders were originally born outside of Canada, compared with 24% of the general population being born outside of the country (General Social Survey 2013). Parallel to this greater religious pluralization, there has also been a significant decline in the overall practice of and identification with organized religion. Individuals attending religious services at least once a month reached an estimated low of 26% of the total population in 2013 (GSS 2013). Although those who say they have no religion still form a minority at an estimated 24% (NHS 2011), their share of the population has grown from 4% since the 1971 Census. This religious “none” phenomenon is especially present among younger generations : among Millenials aged 15-24 in 2013 for example, 35% said they had no religion (GSS 2013). Although also seeing some decline, there still remains a relatively large proportion of Canadians who believe in God or a higher power : an estimated 73% said "yes, definitely" or "yes, they think so" to this belief statement in 2015, compared with an estimated 87% in 1975 (Angus Reid 2015). What distinguishes Canada most from other countries when it comes to religion and spirituality is perhaps its strong regional variations from East to West to North. Specific historical experiences and distinct regional cultures have combined to endow Canada not with one religious landscape as such, but with many. No real surprise in a country over 40 times the landmass of the UK, but with only 55% of her population size. To give one example among many, the Catholic-majority province of Quebec (75% Catholic affiliation, NHS 2011), characterized by extremely low rates of regular church practice (10% weekly attendance, GSS 2013), contrasts the more polarized British Columbian landscape marked by a very high rate of religious nones (44%, NHS 2011), but also relatively high rates of regular practice among its remaining religious (36% of monthly or more frequent attendance among affiliates, GSS 2013). Source : National Household Survey 2011, Statistics Canada. Figure 2 : Individual religiosity/spirituality indicators in Canada (excluding territories), 2013. Source : General Social Survey, cycle 27 (2013), public-use microdata file, Statistics Canada. Source : General Social Surveys, cycles 1-27 (1985-2013), public-use microdata file, Statistics Canada. Missing data points for 1987, 1997, 2002 and 2007 were filled by calculated averages from the previous and posterior years. 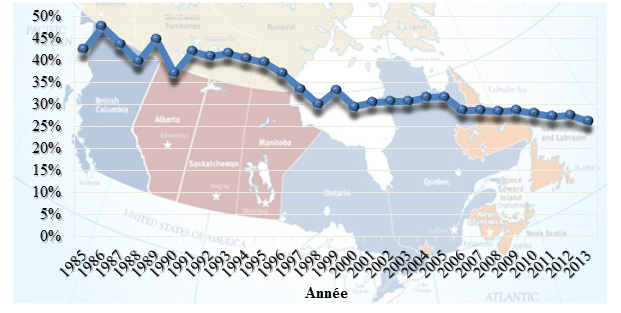 Figure 4 : Religious non-affiliation, by birth cohort, Canada (excluding territories). Source : General Social Surveys, cycles 23-27 (2009-2013), public-use microdata file, Statistics Canada. 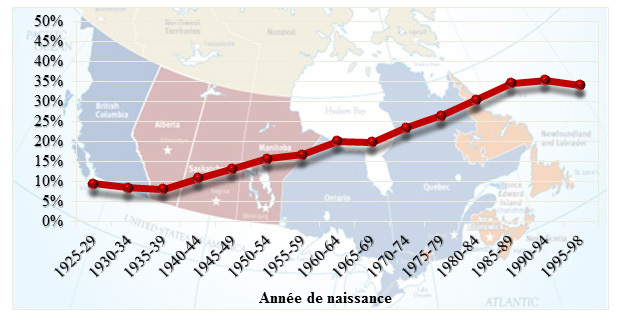 Enquêtes sociales générales (ESG), 1985-2013 [Canada] : cycles 1-27, fichier de microdonnées à grande diffusion (FMGD) ; Statistiques Canada. Enquête nationale auprès des ménages (ENM), 2011 [Canada] : Statistiques Canada (consulté le 7 septembre 2016).